Who's Your Daddy (g. by Rock of Cashel). 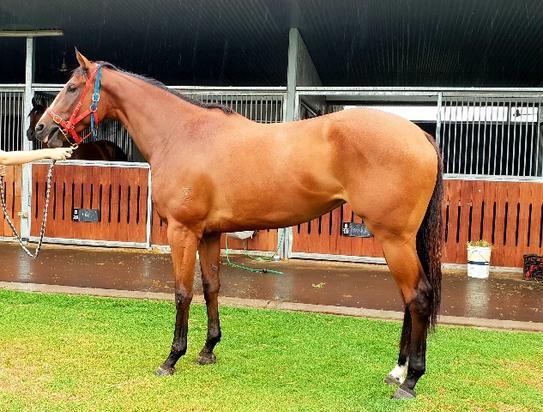 6 wins from 1000m to 1650m, A$79,930, to 2018-19, BRC Treasury Ladies Oaks Day H., GCTC Marcuswilsonracing.com.au H., 3d BRC AICLA & WII H., Ascot Green H.
Adjourned (f. by Murtajill). 3 wins at 1350m, 1450m to 2017-18, Ipswich TC Qld Times H.
Innocent (f. by Nothing to Lose). 4 wins to 1200m, 3d GCTC Sketta Kelly H.
Witness (f. by Real Saga). 3 wins at 1100m, 1200m to 2017-18, 2d GCTC Trackside Tapas P.
Teleban. 7 wins to 1400m, BTC Lydia Jordane H.
Brief Me. 6 wins. See above. I'm Busted. 4 wins from 1100m to 1650m, BRC Sequalo at Lyndhurst H., 3d BRC Darley Australia H.
Captain Nemo. 3 wins at 1000m, 1200m, BTC QBBS H., 2d BTC Falvelon H.
My Rock. 2 wins at 1000m in Aust. Beautiful. 3 wins to 1200m, QTC Doriemus H., 3d QTC Village Motors H., BRC Subiaco Hair H.
Evidence. 6 wins to 1500m in Aust. Ugly. 2 wins at 1100m, 1200m in Aust. Juxtapose. Placed at 2 in Aust. Myban Star. 3 wins at 1400m, 1600m, 2d STC Cathay Pacific H.
Myban Girl. 2 wins. See above. My Conquistador. Placed in Aust. Lutelle. Winner at 1200m, BATC Glen Avon Lodge H.
Some Dimanche. 7 wins from 1200m to 1800m, 3d QTC Analie H.
GOSSIPER (Convamore). 6 wins-3 at 2-from 1200m to 2400m, AJC Oaks, Gr.1, VRC Craiglee S., Gr.2, AV Kewney S., Gr.2, Bloodhorse Breeders' P., Gr.2, VATC Parisienne S., Mitcham H., 2d VRC Oaks, Gr.1, VATC Caulfield S., Gr.1, VRC Turnbull S., Gr.2, Blamey S., Gr.2, Queen's P., Gr.2, VATC St George S., Gr.2, MVRC Caldermeade H., VATC Barton H., Doveton H., Salisbury Welter H., Teppo S., 3d VATC Underwood S., Gr.1, AJC Princess H., L, VRC Smithfield H., MVRC Chandos H., 4th VATC One Thousand Guineas, Gr.1, VRC Edward Manifold S., Gr.2, Ascot Vale S., Gr.2. Producer. Tarbanelle (Nautilus). 7 wins. See above. Solamor. 11 wins from 1200m to 2200m, Bunbury Cup, WATC Vampire Graduation S., Darlington Graduation S., 2d WATC Keymer Graduation S., Poyton Graduation S., 3d WATC Wyolo Graduation S., Martinet Graduation S., Orana Graduation S.
Rule the Stars (Turf Ruler). 10 wins from 1100m to 1800m, A$113,375, VATC Glen Waverley Welter H., John Simpson H., Chelsea Welter H., 2d VRC Winter Championship H., L, VATC Luthers Luck H., 3d VATC Anniversary H., John Simpson Highweight H., SG Garnsworthy Welter H.